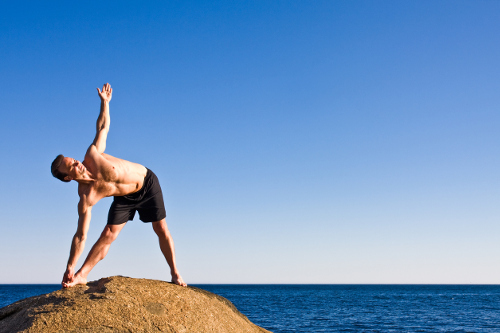 Is Yoga the Cure for or the Cause of Your Back Pain? Home » Pain » Is Yoga the Cure for or the Cause of Your Back Pain? “Pop!” I’ll never forget hearing that sound. It rang out in my ears just over a year ago. I felt my back weaken and tighten up. The worst was the fear—I was squatting heavy weight when the “pop” happened and I didn’t want to get crushed. Fast forward a few hours and ice packs later…and I was still in pain. I got to the doctor’s office and, after an inspection, he told me everything looked okay and recommended some stretching routines. He also told me to continue with regular workouts. A few weeks later, I was as good as new! What I didn’t realize at the time was that he’d essentially prescribed me some yoga poses. Every day, millions of Americans are affected by run-of-the-mill back pain. Too much sitting, not enough exercise, little tweaks, and stress can all contribute to lower-back pain. And a new study is showing that certain yoga poses can be as effective as physical therapy in treating it. This is great news considering recent recommendations from the American College of Physicians are urging reductions in painkiller use. How Safe Is Yoga for Back Pain? Is all yoga safe and effective for back pain? Not necessarily. Researchers from the Boston Medical Center recently identified a safe yoga routine for people with back pain that doesn’t put them at risk for injury—and as I looked through it, I noticed they were the exact same movements my doctor had recommended. In a controlled atmosphere, randomized participants with common lower-back pain—not caused by an acute injury or medical condition—were guided through gentle poses including cat-cow, triangle pose, and child’s pose. Simple relaxation techniques were included as well, and more complex inversion poses were avoided. Participants went to the class for 12 weeks and had their progress monitored. At the same time, two other randomized groups received lower-back treatment. One group underwent physical therapy, while the other received educational literature about managing back pain. When the trial began, 70% of the participants were on painkillers. By the end of the trial, that number had dropped to 50% for the physical therapy and yoga groups, while the literature group’s rate of usage remained unchanged. The conclusion: specific yoga moves are just as effective as—and perhaps less invasive than—physical therapy. If you’re thinking about exploring yoga as an alternative treatment for back pain that can lessen your reliance on painkillers, talk to your doctor. You’ll want to find a class that is catered specifically to alleviating back pain, not a general yoga class that may ask you to perform movements that can result in further injury. Aubrey, A., “Study Finds Yoga Can Help Back Pain, But Keep It Gentle, With These Poses” NPR , June 20, 2017; http://www.npr.org/sections/health-shots/2017/06/20/533505211/study-finds-yoga-can-help-back-pain-but-keep-it-gentle-with-these-poses, last accessed July 25, 2017.